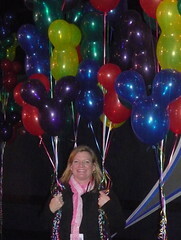 In addition to the fabulous speakers that we heard at Disney Social Media Moms Celebration, we had several other fun events. 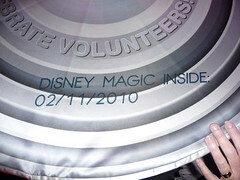 Disney was celebrating volunteer families as a part of their focus on volunteerism in 2010. On Thursday morning we attended a media event where they unveiled the world's largest canned food structure, certified by Guinness Book. There were volunteer families representing all 50 states at the event. As the volunteer families were walking in, someone caught my eye. Sue, who lives not 5 minutes from my house, and her family were the volunteer family being recognized from North Carolina! Holla! They have always been a civic-minded family so it was exciting to share this celebration with them. The canned food structure was incredible. The Disney Parks Blog has great photos, and even a time-lapse video showing the structure being built. For the rest of the afternoon there were volunteer opportunities in Epcot. Health kits were assembled for Haiti, trees were planted with Disney's Friends for Change, and the canned food structure was disassembled and the food packed up so it could be distributed to Florida shelters and soup kitchens. I love that Disney doesn't just talk about volunteering but they are trying to offer families ways to start. 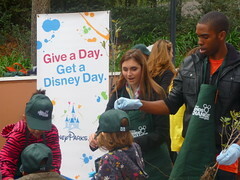 Several Disney Channel stars participated in planting trees with Friends for Change. I love this initiative because it's directed at kids and tries to show them the big impact small changes can make. Thursday night we joined the volunteer families and other media for an amazing dinner and concert. Our dinner was prepared by Chef Robert Irvine and the Dinner Impossible crew from Food Network. The food was so creative in dish and in presentation. The episode is supposed to air sometime in April, I'll be sure to let you know so you can tune in! After dinner, there was a concert starting with music from All Star Weekend. Another thing I love about Disney is they give new young artists exposure. After All Star Weekend, we were treated to Joe Jonas and Demi Lovato singing. They introduced a new song for Friends for Change, "Make a Wave". The song will be coming out in March. My true excitement Thursday night was who I shared a table with. My husband and I sat down and were waiting to explore the food tables when another couple joined us. My husband will tell you that I will talk to a door, so of course I started a conversation. She turned out to be Deborah Way, a Senior Editor at Family Fun magazine. Let me say it again. FAMILY FUN MAGAZINE!! I cannot even begin to tell you how many times Family Fun has saved me with fun ideas of things to do. We have used their ideas not only with our family but with various groups at our church. I was a complete fangirl and gushed all over her. She and her companion were thankfully very gracious. The last thing we did that night was sit down and enjoy the nightime spectacular, "Illuminations, Reflections of Earth". Illuminations has a message about how we are all connected which is especially poignant when you are attending a social media celebration. 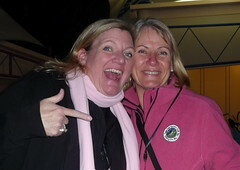 After our day of speakers on Friday, the Social Media Moms Celebration had a closing party. They took us by bus to the back of Hollywood Studios. We had a dinner set up at the Backlot Express quick service restaurant. They also had a dance floor with a dj, but I was having too much fun talking to other moms to dance. 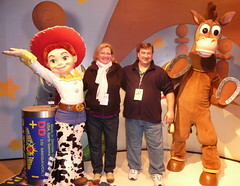 After we had all had our fill, we were led over to the Toy Story Midway Mania ride. We were allowed to ride as many times as we wanted. This ride has been crazy popular since it's opening, so it was a thrill to ride it with no line. We only rode it twice because I thought my arm might fall off it was so tired. It was a fun way to close our celebration. While some of our events were media related, and not intended to teach us about social media, there was something to learn. It is no secret that I love all things Disney. 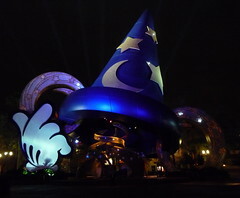 One of the reasons I love going to Walt Disney World is because of the Disney difference. Disney pays attention to EVERY detail, even the smallest of the small detail, that no one may ever see. Disney is all about telling the story and living the story. That's what we are doing in social media with our own stories. We can learn from Disney about telling our story with attention to detail, and attention to heart. I am grateful to have attended this conference, and thank everyone who helped put it together. I have put up just a few pictures on Flickr, you can find them here. My next post I am going to wrap up what I have learned about social media conferences! Great Post Amy and I loved the photos! I love hearing about your conference. You always light up when you talk about Disney the same way I am lighting up now knowing that my favorite story, Alice in Wonderland, is making a comeback. I was happy when I got to see her at the Electric Light parade before they took away. I know how you feel. Neat recap. We had an awesome time! Thanks for linking up at The MamaZone. I just subscribed to your blog.